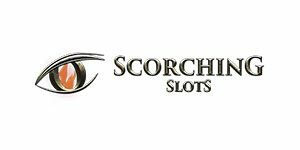 Scorching Slots Casino will then reward you with a bonus (Welcome Bonus is for new players only). The terms and conditions of the bonuses vary between different casinos and might also change over time and between different countries, so it is important to compare the different offers and read the T&C for Scorching Slots Casino before signing up. Launched in 2017, Scorching Slots Casino is owned by the eminent Nektan Limited Casinos, group that boasts an army of successful fan favourite online casinos. Claiming its reputation time and time again, Scorching Slots Casino proudly holds two licences issued by two very strict regulatory bodies – the UK Gambling Commission (UKGC) and Gibraltar Regulatory Authority. Being publicly audited, Scorching Slots Casino has nothing to hide and opts for the fully transparent approach. Nektan Limited experts cater for the safety and security this online gambling venue promises and keep all your sensitive data safe and sound. The games are additionally checked for fairness and are proven genuinely random. The venue itself has a classic, elegant look to it, boasts an easy-to-use navigation and an attractive layout. In addition, the site is available in many languages, which is always a plus – English, German, Swedish and Norwegian. Priding itself on having a spectacularly appealing portfolio, Scorching Slots Casino’s library is embellished with the content by some of the biggest names in iGaming: NetEnt, Big Time Gaming and IGT. The site offers a ‘Recommended’ page which presents you with the most popular games of the month, but it also features filtering and manual search devices. The slot chest possesses over 200 titles that vary in genres and cover basically all themes you could ever think of. To put it short, if you like slots, you will like Scorching Slots Casino. While Scorching Slots Casino naturally specialises in the art of slots, the venue makes sure to meet the needs of all profiles of clients. The place caters for the likes of table games and provides all classics like Blackjack and Roulette, as well as all of them with a modern twist in the form of their renewed variants such as Hi Lo Blackjack, French Roulette and Lightning Roulette, for instance. 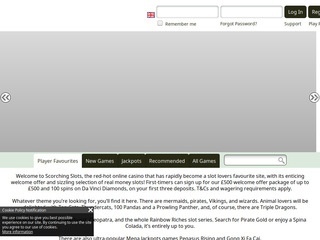 If you are a jackpot enthusiast, you have found the right online casino! Congratulations! Scorching Slots Casino is home to a litany of progressive jackpots made to reward you big time and make you a rich person. Feel the adrenaline and action-packed, fast-paced games with massive winnings lying ahead of you. The opulent lobby includes the likes of Golden Goddess, Wolf Gold, Cleopatra, Pegasus Rising, Top Cat, Isle of Plenty and Divine Fortune. The fortune is counted in millions only, and we see no explanation why you’re still not playing at Scorching Slots Casino! Scorching Slots Casino hosts a luxurious Live Casino lounge that boasts a number of excellent and entertaining titles that will have you playing for hours. The rooms are opened 24/7, and a real dealer will deal for you around the clock. The chest holds the likes of Live Baccarat, Live Blackjack, Live Roulette, Live Dream Catcher, and a mass of their variants. The well-known rules that apply at brick and mortar casinos apply at Scorching Slots Live Casino as well. All games are streamed from a professional casino studio utilising the latest webcam and sound technology, so you get quality, top notch gaming delivered to your home! Typical of a Nektan casino, Scorching Slots Casino deals with banking relatively easily. The tender accepts a few diverse currencies and generally pending and request processing times are decent according to the industry’s standards. The accepted currencies include British pounds sterling, Euros, Swedish kronor, Canadian dollars and New Zealand dollars. As far as banking options go, you can utilise ewallets, credit and debit cards, bank wire transfers as well as SEPA and fast transfers (Sofortüberweisung). Ewallet-wise, your options include Neteller, Skrill, Skrill 1-Tap, Zimpler, Trustly, GiroPay, Boku and Paysafe Card. Visa, MasterCard and Maestro are for you to choose from as well. Requests made using wallets are processed within 24 hours, while other transaction methods can take up to 3 working days. The general pending time for all options totals 48 hours. Every week you can withdraw 500 EUR, and every 30 days you can get up to 2,000 from your account. If at any point of the day or night you need assistance while gambling at Scorching Slots Casino, there is a variety of ways you can get in touch with the online casino’s helpful customer support team. The agents are amicable and responsive, and will make sure your questions are answered. Before asking the question directly, you can search for it in the lengthy FAQ list. If it happens that the list does not contain the answer to your question, click on the Live Chat button on the homepage and chat away in real time! An agent will get back to you in no time and you will get assistance instantly. Another way to contact the team is to send them an email to [email protected] However, do make sure to exclude your banking details like PIN and credit card number, as this way of communicating might be intruded by a third party. If you like to talk, you can also give them a ring to +44 203 968 0711.